Whatever it is, Obama is serially careless. Thus last November he chitchatted chummily with French President Nicolas Sarkozy during the G20 summit in Cannes. “I can’t stand him. He’s a liar,” a chagrined Sarkozy blurted in reference to the man both of them love to loath – Israel’s own PM, Binyamin Netanyahu. Word is that Sarkozy’s feathers were ruffled because Bibi didn’t credit him with Gilad Schalit’s release. Pointedly, Obama not only failed to defend Netanyahu but actually expressed unreserved agreement with his cantankerous interlocutor. “You’re fed up with him, but I have to deal with him even more often than you,” Obama bellyached. The trouble was that this frank articulation of unambiguous aversion towards Israel’s democratically elected head of government – a staunch ally of America – was inadvertently broadcast to journalists covering the event. One would imagine that after his on-mic misadventure, Obama would be unable to again pull off the pretence of impartiality. Nonetheless, he audaciously did just that and welcomed Netanyahu to Washington recently as his forever bosom buddy. The approaching campaign season softens animus – or seems to. Accordingly, Obama spares no effort to convince his Jewish electorate that he’s not halfway as sinister as some say. But when a politician loses fear of amplifiers and visible recording paraphernalia, all sorts of things are bound to spill out. 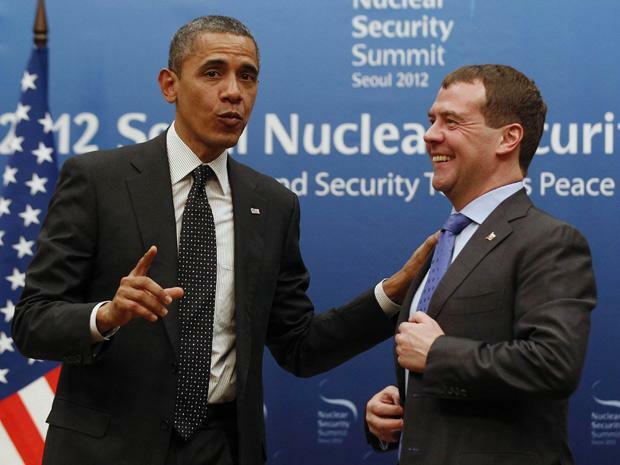 And so at another international conference (the Seoul Nuclear Security Summit last week) Obama hobnobbed with another leader (outgoing Russian President Dmitri Medvedev) when that darn mic was (unbeknownst to him) switched on. Thus unawares, Obama exhorted not only the Russian honchos but also the whole listening world not to fall for his electioneering blarney. His subtext was that he’s obliged to say one thing pre-election to hustle votes, but that afterwards, if he secures his second term, he’ll do another thing entirely. The Obama-Medvedev banter wasn’t Israel-centered. It revolved around America’s planned anti-ballistic shield for Europe (mostly against Iranian attack). But Obama’s predilection for deception should disconcert us too because likely the same sort of double-dealing is now practiced in regard to our life-and-death perils. Obama unabashedly establishes that what he promises now isn’t how he’d conduct himself on his final term, when the dread of the electorate is lifted from his shoulders. It’s not like we didn’t infer this, but Obama’s admission must intensify our intuitive insights. He indisputably plots his course exactly as we suspect. Privately – with all the calculated conniving that implies – Obama relayed a message to Medvedev’s patron, Russia’s once-and-future boss Vladimir Putin, that greater “flexibility” vis-à-vis Kremlin opposition to American missile defenses will follow Obama’s reinstatement in the White House. Post-election (when Obama has nothing to lose), he’d be free to cut a deal with the Russians that would be deadly to his pre-election interests. Once he’s impervious to voter-backlash, Obama in effect suggests to his Muscovite counterpart, he’d be prepared to please the Russians even if he thereby displeases the American people. But he needs a period of grace because the Americans he undertakes to bamboozle are also the very ones whom he’ll have to persuade to reelect him. The purported leader of the Free World no less than offers the most powerful first-hand corroboration of his fecklessness to his prime geopolitical adversaries. Mind you, ex-KGB hotshot Putin wasn’t born yesterday. In 2009 Obama terminated the missile- defense system for the Poles and Czechs. Obamaesque goodwill, though, went unrequited. Russia helped build Iran’s nuclear reactor at Bushehr, stymies anti-Iran sanctions and underpins Syria’s Bashar al-Assad. That said, Obama’s latest cozying up to Medvedev represents a whole new twist on appeasement. There’s no getting away from the fact that Obama appealed for Putin’s forbearance in order to help him win reelection. Putin’s payoff would come when second- term President Obama accedes to his demands. What Medvedev was asked to tip Putin about wasn’t supposed to be shared with American voters or overseas allies. From Obama’s words it emerges that he considered it essential that his capitulation to Russian pressure against missile defense development be kept under wraps – for now. Voters, hence, have every right to ask whether there are other surprises Obama might spring if reelected. In that vein, Jewish voters (those who still care) need to ask whether Obama is being straight with them in his palaver on the Mideast, both as regards Iranian nuke ambitions and Palestinian cynical stonewalling. Obama’s pro-Arab/pro-Muslim predilections mustn’t escape the scrutiny of American Jews, no matter how knee-jerk liberal most of them invariably are. If Obama – as the latest flap in Seoul signaled – isn’t shooting straight with the American public in general, odds that he deliberately deludes his Jewish supporters. Worse than the incredible recklessness of making risky (if not altogether unethical) pitches while wearing a microphone, is the blithe manner in which Obama strove to brush the slipup aside. His flippancy all but screams out that he holds his plebian voters in thinly disguised contempt. Even more distressing is the fact that he appears to have succeeded in laughing away the incident, as if it constituted no more than an actually endearing indiscretion involving pesky electronic gadgetry. He somehow managed to paper over the shocking content of his overheard conversation – conspiring with an inimical foreign rival behind the backs of his own voters, with an eye to duping these voters. Hardly much can be more serious than that and potentially more politically disastrous. Still, Obama comes off as immune to what would quash the prospects of other incumbents. Lack of honesty with the voting public – especially when so glaringly exposed – should by logic be catastrophic to his reelection cause. And yet the fallout is barely perceptible, as if Americans refrain from dwelling on the ramifications of clandestine “flexibility” with Russian autocrats. It’s no joke when the leader of the world’s sole remaining superpower proposes to placate a hardnosed pushy competitor who aspires to regain his country’s erstwhile superpower status. It’s worse when electoral advantage is linked to playing fast and loose with basic security. It’s worst when the president himself is unmistakably heard peddling this shady transaction. These aren’t tendentious leaks from unnamed sources. What was unintentionally imparted to us is as credible as can be precisely because it wasn’t intended for our ears. Truth surfaces when arrogant jabberers let their guard down, feeling free to expound on hidden agendas – expediently hidden for very ulterior motives. Without much ado, Putin was told that his irresponsible record will be rewarded by more gratuitous pliability from Obama. America’s allies everywhere must now be wary in the utmost extreme – and principally so Israel, which is the most threatened and loyal of the allies and in the vanguard of them all. Should Obama win his “last election,” we’ll all have lots to worry about. No amount of post-gaffe lightheartedness on Obama’s part should be allowed to downscale our alarm about his possible reelection. Jews have every reason to be leery of a second Obama term, after he’ll have waged his last campaign, as he himself stressed. Obama’s lack of candor regarding Israel has been demonstrated all too often. The above-quoted badmouthing of Netanyahu at Cannes is only one of numerous examples. And we must always bear in mind that what we overhear by coincidence is surely a negligible fragment of worse utterances to which we never become privy. What the open mic divulges is but an infinitesimal indication of what’s said out of our earshot. But that fortuitous tiny tidbit is a fortunate omen because forewarned is forearmed. We better hope this omen robs us of peace of mind – for the sake of our own self-preservation. All bets should now be off because Obama plainly doesn’t deserve the benefit of our doubt. Indeed, considering shenanigans such as those he broached to Medvedev, doubt becomes nothing less than mandatory. An enslaved people who have fallen for almost 19 years of Olso,Road Map land for rockets and jihad scheme of their Pharaoh land Masters have intuitive insight ? All I see are perverse unJewish leaders going after good,faithful Zionists and driving them out of their homes to please their Fourth Reich,Quartet god’s of no-peace. You and so many still don’t get it ,Obama knows he can get away with everything and anything. The wholly given to evil, government media will protect their fellow destroyer,just as the evil media in Israel serves the forces of darkness. From day one it has been evident to me and a few others that God has given this decadent,perverted nation a destroyer to lead it to destruction and this is why Obama is acting the part to a T.
A news report this week said that two thirds of the Jews in the US would vote for Obama again. The slaves love their evil master no matter what he does. I am reminded at how Obama totally ignored the servile,bent spine Netanyahu’s request to free Pollard and for this shameful treatment Israel’s Prime Minister could not even make a firm,unwavering demand against American imperial injustice against 1 fellow Jew. The slave knows his place and serves his masters well. Those who ignore God and look to Pharaoh Obama for Israel’s security will have something to cry about. If Obama gets reelected, he will take on Israel and try to really harm it, as much as he possibly can…this man is ************DANGEROUS*************for Israels health !!!!!!!!!!!!!!!! And the lamestream media still abdicates its role in vetting this @@@@@@@@! “Jewish voters (those who still care) need to ask whether Obama is being straight with them” – Those few who still care will surely be reassured by his celebrating the Passover seder. He’s even wished them “Chag Sameyach!” Imagine! He must be philo-Semitic and love Israel! What more can they want from their president? US Jewry is the schmaziest and kitschiest thing in the universe. Thank you, Sarah. You set out in relentless, inimitable style what ought to be obvious to anybody. But, when it comes to the vast majority of American Jews, you might as well be talking to the wall. Nobody has asked me, but I am an American and a Jew who will not vote for Obama. I think he is evil and belongs in jail. It breaks my heart that other Jews cannot see him for what he is. I have not even managed to convince family members as they are so enmeshed with the MSM and PC spin. I can now understand the mind set of European Jews prior to WWII. Then they could not believe the evil they were confronted with, and had no defense against Nazism. Despite the fact that governments and replacement theory Christians had been killing Jews for centuries, genicide is another thing altogether. But since the Holocaust, as zionsgate so thoroughly outlined above, Jews have fallen for one scheme after another hoping for a peaceful future in Israel. I am amazed the Jewish race has survived and can only conclude it is not you that is preserving you, it is God Allmighty. American Jews are so incredibly naive they would walk into gas chambers again just for an Obama smile or promise. But they have no right to risk destruction of Israel or of me and my family for whatever insane idealogy they share with that liar. Nothing like a good ole full-blown, frontal attack on Iran’s nuclear facilities to become the ultimate fly in Obama’s ointment, or cold soaking rain on his parade. We’ll get to see how cool under pressure he is after these fortuitous events. Noodles, that would be the best possible scenario to happen BEFORE the elections ! Well said. I’ve been seeing this all along, but friends say it our paranoia. Unfortunately, it seems to be true. Obama IS already working back channels with Iran…if he will be reelected, he will try to sell Israel out to the rabid Jew hating mullahs…Obama 2 is a looming mortal danger for the Jewish state !!!! And the disguise Chris is “peace loving, moderate secular Muslim, liberal leftist”. It goes a lot further than Hitler’s or Ahmadinejad’s maniacal, racist rantings. Mrs. Honig, I always enjoy your incisive articles, and I couldn’t agree with you more about President Obama. He cut his teeth on Chicago polititics, one of the most corrupt cities in America, and listened to the Reverend Wright’s anti-semitic ravings for twenty years. I cannot for the life of me understand the attraction of my fellow Jews. Keep up the good work! Hi, I am very concerned about a nuclear Iran. I am a Christian and support Zola Levitt ministries. I’m not worried about very high gas prices as I am about you folks getting nuked. The preemtive strike is going to have to be caaried out with the blessing and protection of the G’d of Abraham, Issac, and Jacob. G’d bless and protect you good folks in the days ahead. I’m not that anyone understands that he is so blindingly arrogant that he truly doesn’t care. Like most narcissists he believes the world sees him as he sees himself, untouchable and omniscient. Brilliant piece. It would be great to get it out into mainstream US media. Keep the good work!